The stars are all aligned for me lately! Yesterday I visited just-the-most-awesome-store-ever for the first time -- Craft-o-rama! This hip store on stylish South Congress Avenue carries an edited selection of perfectly pretty fabrics, lots of sewing supplies, knitter's delights, quilter's tools and patterns, original art by locals, handmade jewelry and bags and lots of other cool stuff. Sensory overload hit me in the most blissful way as I selected some fabrics and patterns, and FINALLY signed up for a beginner's quilting class. I can't wait for the quilting class. I have wanted to learn this for many moons now, but kept missing the classes at another quilting-only store across town. Imagine my delight when I was able to sign up for the cool kids' quilting class at just-the-most-awesome-store-ever yesterday! My class is in a few weeks. I'll post a photo of my quilt wall-hanging after that, but I'll give you a hint: the fabric I bought for it is gorgeous and perfectly matches the big bedroom color scheme of pale-blue, orange and brown. As I payed a very reasonable price for my class, patterns and fabric delights yesterday, I saw a big jar with little slips of paper in it. A placard by the jar called me to the action of writing down my name and email address to enter a drawing for a $50 gift certificate to just-the-most-awesome-store-ever. Yep, I gave away the punchline in the title, I won! (Again, after winning that $50 gift certificate to Warm Biscuit earlier this month.) Don't hate me because I'm lucky! I've mentioned my quest for the complete series of the original 56 Nancy Drew novels -- only the editions published circa 1978 - 1985, which is roughly when I was reading them as a girl. I have not yet mentioned one of my biggest hording secrets though. I own a lot of books I have yet to read. Some were gifts, some I bought and some were trades or loans. I can't stop collecting books. If I stay out of BookPeople, then I'm buying them on Amazon. If I ban myself from Amazon and BookPeople, then I'll buy more books at the airport, at Target or from the shelf by the cash registers at HEB grocery store. Call it an addiction, an affliction or a compulsion. Whatever you label it, it amounts to a lot of books and not enough time to read them. Yes, I'm reading three books at once. I should be studying my script for two shows next week, and looking over material for an audition the following week, but I keep rationalizing to myself that I work best under pressure. Italian the Easy Way by Marcel Danesi, Ph.D.
and LOTS of cookbooks, too many to list. I have got to stop amassing books and magazines. Help! If you see me lingering near any purveyor of books, grab my elbow and pull me away. Like so many sailors seduced by the sirens' songs, bookstores have an entrancing, magnetic pull on me. The term "fight fair" seems an oxymoron to me. Odds are that if one or all parties are being fair, then there is no fight. If one or all parties respectfully express differing opinions, then it's hard to work up a to a brawl or harsh verbal sparring. It usually takes one party throwing a verbal or physical punch and another party punching back for the situation to be a fight. Otherwise one might label it an exchange of information or, in the case of one physical punch being thrown, but not reciprocated, assault. Over the course of a little over a year (April 2006 - June 2007) I worked with Chad to buy our first home and spent six months of hard labor fixing up the place, my dad died suddenly and very unexpectedly at the young-ish age of 58 and my dad's dad died at the ripe old age of 94. To say that it was a rough year makes me want to laugh and cry at the same time. It was beyond rough. Before my dad died, I was already feeling mentally, physically, spiritually and financially drained from our house purchase and work. I was exhausted in every sense. After my dad died, I spent a few months alternately on auto-pilot while still working and finishing house projects, and alternately crying on the couch in front of television shows from my childhood -- semi-paralyzed with grief, shock and more exhaustion. Sometime in late February 2007, I decided to force myself to get a grip on my health. I needed to start taking better care of myself. Think about the safety presentation that the airline attendants give prior to take-off. They all say that should the cabin lose air-pressure, the oxygen masks will fall and that you must put on your own mask before assisting those around you. Metaphorically speaking, I was neglecting my own oxygen mask. I had to remind myself that I'm not much good to anyone else if I'm passed out. I started exercising regularly again. I started cooking again and eating a much healthier diet. I once heard some self-proclaimed expert on exercise and depression say that "you can't exercise regularly and feel depressed. It just doesn't work." That blanket statement fails to describe every case of depression or ennui, but exercise definitely worked for me. I also went to a therapist for the first time in my life. I think that by the time I finally got myself in to see the therapist, I was on the mend as far as grieving for my dad went. I saw the therapist four times. Each time, this person just told me how "great" I was doing. I decided if I was doing so "great" then I didn't need to keep paying this person to listen to me re-hash what made me sad months before. Talk therapy wasn't for me, but I think visiting counselors, therapists and psychologists is "great" if they are helping you. I got a big, scary-looking mole removed from my back. The biopsy proved that it was not cancerous, but knowing it wasn't a danger relieved that worried voice in my head every time I saw it in the mirror, and quieted Chad who kept telling me that the mole was growing and looking different. I have a scar from the procedure in the middle of my back, between my shoulder blades. It's a good thing I'm pretty flexible from practicing hatha yoga or I wouldn't be able to reach that scar to apply Mederma to it twice a day. If your doctor writes a prescription for Vicodin, fill that prescription. I decided I was tough and didn't need such a strong pain-killer. I decided I would just rest and take some extra-strength Tylenol. I sobbed with pain about three days after the minor surgery. I shoulda had that Vicodin! I went to the dentist after two years of not going. I didn't like my old dentist, who tried to upsell me on every procedure, then acted visibly annoyed when I rebuffed his sales advances. He was like a used-car salesman. I don't need that drama from someone sticking sharp things into my mouth. I love my new dentist. I go to Austin Dental Spa. It really is spa-like. While the dental assistant cleans your teeth and does the initial exam, you get a warm lavender filled pillow under your neck and around your collarbones, then a massage therapist rubs your hands and arms. Aaaaaahhhhh.... I did get the lecture about flossing more, but no upsell! I finally used all of my accumulated spa gift certificates for many massages. Every massage therapist commented on the severe knots in my neck and shoulders. They also commented on all the bruises I had. One massage therapist asked if she needed to have a word with my husband. (I swear that Chad has never caused any of those bruises!) I was bruising so easily and so badly because I was exhausted and stressed. All of the various massage therapists told me to start taking vitamin C with bioflavonoids and a B complex vitamin. The vitamins are helping, though I only take one of each everyday instead of the two to four of each that the labels advise. I found a regular massage therapist who does deep muscle work. I know that my crazy network of knots might frustrate other massage practitioners, but Hillary sees them as a challenge. I won't lie, deep muscle massages hurt. Over time though, I've noticed improvement in my neck and shoulders. I have days when I'm aware that they are NOT hurting! That's progress. Regular massages have reduced the incidence of tension headaches for me too. If you can afford to get massages (from a reputable, licensed professional) do it. I started getting my face sand-blasted once a month. The nice/technical name for the sand-blasting is microdermabrasion. With all the stress I went through, my normally peaches and cream complexion was looking bruised and curdled. I compare the microdermabrasion treatment to exfoliation on steroids. The aesthetician uses a little wand to blow mini-crystals over your skin and then vacuum the crystals and dead skin with pollutants off of your face. I like these treatments, but hate the upsell that comes with them. Behind my protective goggles, I can hear the aesthetcians roll their eyes as they launch into the latest sales pitch for the clinic. They hawk laser hair removal (which in my experience is very painful, expensive and only slightly reduces the amount of hair), photofacials, cellulite-reduction treatments and all manner of lotions and potions. Shhhhh, hush-up and finish the sand-blast already. Finally, in my need to self-medicate, for self-care and for self-improvement, I started this blog. Initially, the purpose of the blog was to show pictures of the progress that Chad and I made on this old house. I needed to prove to my family that we weren't crazy for buying a fixer-upper. The blog has evolved into an outlet for me to reflect, report and just write. I don't remember a lot of what happened while I was mourning my dad's passing. The blog reminds me that happy things were going on during that time, even if I was sleep-walking through those moments. In summary, if you ever feel the need to self-medicate, I endorse a healthy diet, regular exercise, a good daily vitamin with C and B-complex, regular dental checkups from a dentist instead of a salesperson, regular massages and to fill that pain-killer prescription after any medical procedure! I'm on the fence about the microdermabrasions. After yesterday's post, Jensational asked if Kenji was the kitty who tried to steal our Thanksgiving turkey one year. Yep, that was her. Kenji was about three months old and very, very tiny. I have the vet records to prove that she only weighed about four ounces at the time. She was seriously malnourished when we first got her. The vet had the "she might not make it" talk with me. I'm happy to report that she now tips the scales at a healthy eight pounds and six ounces. Anyway, her first Thanksgiving in our home, she weighed about four ounces. Chad and I cooked our own modest Thanksgiving meal that year in out tiny 1930s apartment. We made a little turkey breast instead of cooking a whole, big turkey for just two people. Chad and I made our plates and prepared to settle onto the living room floor for dinner. (We're fancy that way.) Chad set his plate down in the living room and joined me back in the kitchen to grab a few condiments and silverware. We heard a clatter out in the living room. Chad and I ran back into the living room just in time to watch tiny, baby Kenji dragging a big slice of turkey breast behind the chair in the corner. Chad pulled the chair out from the corner. We watched tiny, baby Kenji kill-shake the turkey. She growled at us like a junkyard guard dog when we tried to take away the turkey that weighed almost as much as she did. To reward her feat of super strength, we gave her a plate with a little bit of baby-bite-sized pieces of the turkey. Kenji has always been scrappy and stubborn, but also a very affectionate and cuddly lap-cat. She's a little walking paradox who will steal your dinner. Here it is, the post you've been awaiting with great anticipation, my cats' nicknames! Chad came up with her name after I wanted to name her Pumpkin. Marigold fits her better. Rescued from: a family in Round Rock. She's a city girl like me. The suburban lifestyle just wasn't for her. We thought she was a boy when we first got her. Kenji means "second son" in Japanese. Rescued from: a feral cat colony at a car lot when she was just three weeks old. Nobody could find her mom, and she was eating adult cat food. He came into our home with this name due to his super-loud and persistent meowing when he is unhappy with a situation, scared or confused. Rescued from: a feral cat colony in Travis Heights. Sonic spent some time with a nice lady named Kay from Thundering Paws cat sanctuary. Kay socialized him and got him ready for adoption. My husband mentioned this cool program to me, and I want to pass on the info. As NaBloPoMo drags on, I'm pressed for blog post subjects. I'll spare you a post on all of my cats' delightful nicknames for a day longer. Through this "give one, get one" program, you can buy a basic laptop computer for $400. You get one laptop for a child in your family, and another laptop is automatically donated to a school or classroom in a developing nation. Genius. Visit laptopgiving.org for more information. The program runs through December 31 of this year. You can also simply give by donating $200 for a laptop to be sent to a classroom in a developing nation. Come back to my blog tomorrow to learn all the fascinating nicknames for my three furry babies (she typed with calculated sarcasm and full knowledge that no one cared). Start humming the chorus of The Bangles' song "Walk Like an Egyptian" to better understand my delightful title. If you had a Barbie doll growing up, you may remember that her legs didn't bend at the knees. Unless you had that one special-edition Barbie with the weird rubbery knees that you could stretch to something estimating a bend and watch them snap right back to stick-straight. Barbie's hip sockets didn't allow for much movement either. I'm sore from yesterday's Turkey Trot five mile, somewhat hilly course. My bootie and hip sockets hurt. My knees don't want to bend. I did some chores around the house today with a limited range of motion. Walking up and down the few stair steps to the laundry room was especially ouchy. I'm sure it looked pretty funny too. I can't imagine having Barbie doll's silly top-heavy proportions, her perpetually arched feet (the better to wear high heels, my dear), and being able to move much on a daily basis. Poor Barbie. Stupid Mattel. This morning Chad and I trotted with the other turkeys at the seventeenth annual Thundercloud Subs Turkey Trot to benefit Caritas. Chad planned to walk the one mile route. However, I don't think that one measly mile is worth getting out of bed early on a holiday and braving the chilly forty-degree temperature. I signed us up for the five mile trot, and I pressured Chad into jumping into the pack for the five mile route. It was so much fun! There were people pushing strollers and walking/running their canine companions. Chad and I hope to have a dog of our own next year to take to the trot. There were groups of people sitting on their front lawns along the race route cheering on the walkers and runners. One group had big water bowls for the dogs, so thoughtful. Chad and I completed the five miles in a little over an hour. Yeah, no four-minute miles here. Earlier this week Chad asked me how I feel about not working during the holiday season this year after twenty years of working over the winter holidays. I admit that I have mixed-feelings. I'm so happy about the prospect of enjoying the company of good friends at the Thanksgiving potluck later today without having to run off early to visit pets for other people, without worrying about getting up early tomorrow morning to work a retail job, without making the rounds at the near-empty residence halls like I did back in college. Somehow, it doesn't seem like the holidays if I'm not working. I have fought the temptation/compulsion to apply for a holiday job at the myriad of shops and boutiques around town that are still hiring. Chad kindly reminds me of the mornings that I would put my feet on the floor and wince at the pain from retail days that dragged too long. He reminds me of the daily stories I brought home about mean or crazy people I encountered at the various stores where I worked over the years. (I encountered many nice people too, but tangling with one mean or crazy person can seriously ruin your whole day.) Chad half-jokingly offers to pin a note to my shirt each morning that says, "please call my husband if I ask for a job application," at which point he will talk me down. I owe Chad some thanks for going the extra four miles for me this morning and for reminding me to take care of myself this year during the holidays after so many years of caring for others. Positive peer pressure can be a very healthy thing. Chad and I bought our holiday lights at Lowe's tonight. Our trip to Lowe's reminded me to share this other outdoor lighting project before Chad makes like Santa up on the rooftop with the holiday lights. The Malibu brand outdoor lights and transformer were easy to install. The directions were simple to read and outlined everything needed for the project. I give a whole-hearted endorsement of these Malibu lights. For about $120 we were able to buy twelve pivoting spotlights, 100 feet of outdoor electric cable, the transformer box, a programmable timer and the outlet weather guard needed for this project from Lowe's. We spent a few hours placing the lights, digging a shallow trough for the electrical cable and then fussing with the angle of the spotlights. Easy peasy! In preparation for this project, Fox Services installed three outdoor electrical outlets on our old house, because there weren't any previously. As always, the Fox electrician did a great job, was polite and quick. I love that these lights make our house look so fancy. The lights also add security by making the house more visible after dark. Ever since one of our octogenarian neighbors regaled me with the tale of the time a couple of car thieves came to an abrupt stop in the limestone planter on the front of this house during a police chase, I've wanted to add the lights to the front planter. I don't want to be awakened by headlights coming through the front wall. Crazed drivers can no longer claim they didn't see our house! I watch movies, yes even movies I like, and notice the doors, the tile back splash, the floors, the wall color, furniture and general set decor. I salivate over good bathroom and kitchen hardware I saw in The Upside of Anger. I daydream about American bungalow style, paneled doors I saw in You, Me & Dupree. I pine for crazy, multi-colored, patchwork-style kitchen floors I saw in The Princess Diaries. I did not love living through the mess, dust and fumes of our home projects for six months with only one weekend's escape at a nice hotel. Lots of cursing, crying and eating fast food plagued me during those six months. Shudder... I did love picking out the paint colors, the hardware, the bathroom tiles & fixtures, the furniture, rugs, ceiling tiles, etc... I enjoyed talking to the nice man from Austin Deck Specialists about different options for our deck. I reveled discussing the possibilities for our new driveway with interlocking paver stone guy, especially when I saw the amazing curb-appeal enhancing results that this one project yielded. I absolutely love our house and the results of all of our hard work and thoughtful decisions. The only big project left on this house is to replace the sad, sagging fence. I talked to those guys today. Oooooooh, I'm liking this new composite wood material. The saddle color will weather to perfectly match our house. So why do I still peruse the real estate listings? Maybe I should study to be an interior decorator, but I fear that I'd get stuck with clients who have forty different names for beige, and I'm violently opposed to beige, Mommie Dearest violently opposed. No wall-to-wall beige ever! I have enough sense to know that I don't want to get my realtor's license or become a house-flipper in this market. How do I sublimate this compulsion to redecorate and renovate without driving my sweet husband batty and without sending us into debtor's prison? My dad passed away over a year ago. I heard an old wives' tale that a person has to survive a year and a day after losing a loved one before truly realizing that life continues despite the loss. I lived through my dad's birthday, my parents' wedding anniversary, Father's Day, all of the major holidays and finally the one year mark of my dad's death. Father's Day was the worst. I loved to buy clothes for my dad. He was a self-professed cheapskate, and a bit proud of the fact. I love a bargain, but I also love good fashion and quality craftsmanship. I wanted to keep my dad looking dapper in clothes and accessories that weren't from WalMart. As Father's Day 2007 approached, I caught myself thinking so many times, "that's a nice shirt/tie/pair of shoes. I want to get that for Dad." Then about four seconds later I'd experience a little jolt and remember that he no longer needed any material possessions, and that the US Postal Service doesn't deliver to Heaven. As Thanksgiving approaches, one can't help but think of family. As I struggled to complete my course on the elliptical machine at the gym today, I glanced up at one of the TVs mounted on the wall above me and saw a commercial with a happy family sitting down to their Thanksgiving meal. For the first time since January, I cried on the elliptical machine. (My dad died while exercising on his treadmill. Sometimes the gym does not hold happy connections for me.) I soldiered on and finished my workout, crying only for a minute or so. I made it through that year and a day since my dad's passing. I'm well aware that life continues. But the grief sneaks up on me still. I was out of town this year during the Komen Walk for the Cure to benefit breast cancer research. Chad and I usually walk the race route together. I still wanted to support the cause this year despite missing the race, so I bought a few tickets to the Simon Evening of Giving through the Komen Foundation. Of the $10 for each ticket, $7 benefits the charity from which you bought your tickets (in my case, Komen) and $3 benefits the Simon Youth Foundation. One of my Jen-friends and Hillary came with me tonight to shop at Barton Creek Mall after regular mall hours. Many of the stores were offering discounts. I took advantage of 20% off at Yankee Candle and 15% off at the Gap. Lots of local restaurants were there with free sample-size plates of food. I enjoyed chips and queso from Chuy's, hot chocolate from Norstrom's Ebar, pear with walnut salad and tomato bisque from Nordstrom's Bistro. Hillary and Jen sampled chicken and pasta dishes for Cannoli Joe's, barbecue turkey from The County Line and mushroom with chicken pasta dishes from Buca di Beppo. There were also drawings for door prizes, choirs performing and a few groups of dance classes performing. Many of the charities participating in the event had tables set up around the common areas of the mall. We all visited the Komen table and bought travel mugs. I visited the American Heart Association table and made a donation in memory of my dad. The most visible charity group by far had to be a table of Austin's finest firefighters selling their hunky calendars. Their table was parked right outside of Victoria's Secret. Was this placement on purpose? If so, was that appropriate? Overall, this event was so much fun! I'll do it again next year in addition to the Race for the Cure. There are days when I don't feel like talking. I don't feel like dealing with whatever is on my mind or whatever is in my face demanding attention. I feel like escaping into a book's plot, a brain-candy television show or dreamless sleep. On these days, I keep a low profile. I don't answer the phone, whose ringing is an assault on my ears and psyche. I won't appear on iChat. I don't respond to emails. I don't answer the door. I need the distracted solitude. Sometimes I accuse Chad of camping up in his Chad head, meaning that he withdraws into himself. Pot, kettle. I vacationed in my own head for quite a while over an eighteen-month period. I needed to deal with things that I would rather not. One might say that I was not myself. I would argue that I was myself, but I didn't have the emotional energy to spare on projecting a sparkly persona. I think it's okay to cuddle into that cozy couch in the living room of your mind sometimes. It's okay to be quiet and still, boring to be around, if it means you can keep your mental well-being intact. You have to force yourself to surface once in a while, to peek out the curtains onto all the good stuff out there, outside of yourself. Or throw open the front door and defiantly yell, "next?" to the world when you're ready. Don't send out the change of address cards. Don't hole away permanently like a hermit. Vacation up there in your own head like an invaluable time-share property. 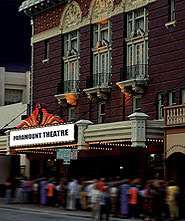 Each year around Thanksgiving it seems that the good movies start rolling out to the theaters. Perhaps it's the looming deadline for Academy Award nominations, the cooling weather, the earlier sunset, the fact that most people have some time off work around the holidays or some synergistic combination of the aforementioned factors. Whatever the reason, movie season is here. Chad and I both nursed cold/flu symptoms last weekend, but by Wednesday night of this week we were ready for a movie date. We saw Lars and the Real Girl. This was a quiet, quirky movie about a sweet, delusional man and his relationship with a life-size doll. I laughed, cried, sympathised and empathized. It was brilliant. I don't want to give away any spoilers, but if you see this movie, email me so we can discuss. Beowulf - This looks like video game graphics with dead-eyed actors. Face it, this is The Polar Express for adults. Before the Devil Knows You're Dead - I dislike Ethan Hawke and the subject matter sounds gut-wrenchingly heavy. Lions for Lambs - I dislike Tom Cruise. Save Katie Holmes! Plus I don't need to sit though heavy-handed, spoon-fed moralizing. Southland Tales - I've read three reviews that say it's awful, which is a shame, because I like the actors in this movie. Into the Wild - I hate camping and loathe road trips. I'm not keen on watching a whiny, affluent kid get in touch with nature while he hitchhikes. Mr. Magorium's Wonder Emporium - Have now read a few bad reviews and have a first-hand friend account that this movie is bad. Oh yeah, and I'm not eight-years-old. For many years, I wanted to be in a book club. I miss school and the academic sharing. The thought of reading books and getting together to discuss them and share ideas sounded heavenly. I'd hear friends refer to their book clubs, and I guess I looked too eager, because I'd be informed that their book club was at maximum capacity for members. Fine. Your book club was probably stupid anyway. (But I really wanted to be in a book club.) The first rule of many book clubs seems to be: Book club is full. No newbies. A few months ago, a darling acquaintance invited me to join her book club. Hurray! Even though the book selection looked like something I would hate, because it was nothing I'd pick out myself, I read the book cover to cover. I liked it. It was The Other Boleyn Girl by Philippa Gregory. I enjoyed the historical fiction, and have always been interested in the House of Tudor. There were a few bodice-ripper scenes that I found tiresome, but it wasn't a huge part of the book. At my first book club meeting, I made myself look kind of silly by actually trying to discuss the book. Apparently, the second rule of many book clubs is: In book clubs, only a few dorks read the book, and no one wastes much time talking about the book. I attended my second meeting of book club tonight. 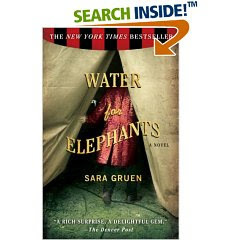 Only the hostess and I read the book this time, which was Water for Elephants by Sara Gruen. Again, I liked the book. The hostess and I chatted about it for a few minutes. She is the same darling acquaintance who invited me into the book club. She had gone to some trouble planning the snacks to fit a circus theme since the book was about circus life. She served mini corn dogs with fancy mustard, gourmet popcorn, frosted animal cookies, yummy cinnamon cupcakes with chocolate frosting and some other snacks. She had old-fashioned boxes of animal crackers that look like little circus train cars carrying the animals for favors. It was too cute. I love the book club meetings, because they afford time with friends in the relaxed setting of a member's home. We have great gab-fests. In my short time in the book club, I feel closer to the other women who go. I'm so happy to finally be in a book club, even if it wasn't what I thought it would be. I'm going to tell you the third secret of most book clubs: Book clubs are not actually about books. Update: Tara was the first to comment, so she wins! Faithful readers or complete strangers, be the first to post a comment that you want a free subscription to Glamour magazine for one year, and I'll sign you up for one. No strings attached. I got an offer to renew my own subscription for a year and to get a free one year subscription for a pal. I love sharing, especially when it's free. I like Glamour magazine because it is a nice balance of fluffy shopping news, eye-candy fashion, silliness and pithy stories about real women. Glamour does not stalk celebrities, offers real useful advice for staying healthy/exercising and features a few stories each month about women around the world working hard to make a difference. I've used some of the body by Glamour tips during this year's get-healthy kick with good results. If I know you, just sign your name to your comment. If you're a stranger, leave me an email address so I can get your mailing address. Be sure to put the "at" symbol in your email like this: [at], so that those pesky email programs don't harvest your address. File this one under "Lucky". I won a gift certificate to a cute kids' stuff shopping site called Warm Biscuit. Yay! I can't wait to start picking out gifts for the nephews and nieces. With some upcoming baby showers, I know I'll be referring lots of peeps to this cute shop. The giveaway was sponsored by one of my favorite blogs, Hostess with the Mostess. What's smaller than a tall? A short. This according to the barrista at Starbucks tonight. I told the barrista I wanted the kid-size hot chocolate. The barrista barked back, "short." I missed the contextual clues, and it took me a blank-faced moment to ponder this information. Yeah, I was wearing flats versus the usual four-inch tall heels, but why was he calling me short? Oh... blink, blink... he means that the kid-size is called "short" in Starbuckese. Chad was standing at the counter with me. He was tickled by the exchange and said, "a short for the shorties. A short for my shorty." Chad was referring to kids as shorties and then to me as his shorty. He's cute that way. For some reason, Starbucks is trying to keep it a secret that there is a smaller option than the tall size for their beverages. The "short" is not a posted option on the menu, but they have that smaller cup ready to go if you order it. I don't mean to sound all dainty, because I'm not, but at 8:00 PM, I don't need a big coffee drink or a big hot chocolate. I just need a little taste with a mini-jolt of caffeine. Just enough buzz to keep me up until 2:00 AM; not 5:00 AM. In case you're wondering, I usually order a tall size beverage during daylight hours. I start snipping at people if I get a grande. Seriously, stay outta my way! The only time I order a venti size is when I'm getting iced tea. I could put away three venti iced teas before I get caffeine-cranky. Mmmm... now I want iced tea. As soon as Labor Day happened, I saw the Christmas decorations and promotions start at retailers. I don't mean to sound like Scrooge or like a holier-than-thou hypocrite preaching that we've lost the true meaning of the holidays, but I hate seeing Christmas decorations before Halloween. Reading the newspaper today, I skimmed through all of the bad news about the war, the environment and the United States' economic forecast. I also flipped through the glossy sale ads for stores. I started thinking about what I want to send for Christmas gifts this year to close family and the very few friends with whom I exchange Christmas gifts. I admit that I even thought of a few things I want to receive for Christmas gifts. I encourage you to donate to the charitable cause of your choosing this year. I've always liked Unicef. Your local food bank is probably a good charity to support. Your local Red Cross and the national Red Cross do a lot of good work too. In the interest of full-disclosure, all charitable bets are off when birthdays roll around. Friends and family will get the usual birthday cards and gifts without the preachy message. It's my opinion that your birthday should be that one delightfully self-aggrandizing/semi-selfish day each year that's all about you. For several years, Chad and I resisted the consumer compulsion to buy a huge flat screen TV. Then Chad decided we really, really needed one. If you have the big high-definition TV, then you need to spring for high-definition cable. If you have the high-definition TV and cable, then you need a new DVD player too. With a few sighs and eye-rolls, I let Chad haul our old faithful boxy TV and old DVD/VCR combo machine to Goodwill. No sooner did Chad drop off the donations, than the new TV with all its new accouterments started crashing the cable connection every few minutes and making disconcerting popping noises. We're one of those households that only has one TV. Our one new TV, though super-impressive looking to gadget-geeks, wasn't working right. Chad scheduled the cable repair-person to come check out the situation. The cable guy said that the TV was the problem. Chad called the customer service phone line for the TV and was told that a repair-person couldn't come out for about two weeks. After a bit of online research, he found an authorized repair shop about a half-hour drive away from our house. (We rarely drive more than ten minutes to get anywhere. We're somewhat conscious of our carbon footprint that way.) Chad loaded the giant TV into his car for a road trip to the shop. The TV repair shop person said that the TV was fine. Chad brought the TV back home with a new cable box and plugged everything back into the outlet. Sparks shot out of the wall outlet, frightening Chad and our three cats. I wasn't home for this spectacle, but got to hear about it later. Chad then tried several other electrical outlets in the living room and by process of elimination, decided that the electrical outlet behind the entertainment console was to blame for the sparks and all of the TV-related problems. Fox Services to the rescue again! The electrician from Fox Services explained to me that two of our living room plugs weren't wired correctly and thus weren't ground properly. He showed me the wires and started giving me a lesson on electrical engineering and my eyes kinda glazed over. He was very nice, if a bit overly enthusiastic about the history of wiring as it related to our fifty-five-year-old house. The exciting conclusion is that he fixed our electrical outlets. As I type this, Chad is playing The Simpsons Game on the giant TV. If you ask me, seeing the game so giant on the TV makes it look pixelated and funky. I'll admit I do enjoy seeing movies on the big TV, and the flat screen looks a little nicer than the old boxy TV did in our living room. I mentioned a few days ago, that due to technical difficulties involving some really effective wireless internet security, I could not yet upload all the photos of my nephews and niece. What I didn't mention was that I handed my camera over to my seven-year-old nephew, Christopher. It was my old Canon Power Shot, so I wasn't worried about the little dude breaking it. Christopher took some great photos. He's got a natural eye for composition, framing and lighting. I tried to get Christopher a Fisher Price digital camera for kids last year for his birthday, but he said he wanted some crazy Lego set instead. This year, he's getting a camera whether he wants it or not! Nurture that talent. Mary and I with the Texas tattoos I brought for the kids. Just ask Aunt Jenn when you're ready for your first tattoo! She's happy to help... as long as it's temporary. Mary in a candid moment. The Playground Series: Christopher's best work to date, featuring Charlie, the artist's brother, and Chad W., the artist's dad. An artsy shot. Check out the shadow of the flowers on the wall over Mary's shoulder. Here's a photo I took of Mary licking the plate clean. Mmmmm... pumpkin cheesecake. Chad and I went out to a music show at The Parish club last night. The venue and crowd were too small for me to call it a concert, and the music was more alterna-pop than straight up rock music. It felt weird to be out with the 20-something-year-old kids. As I looked around, I saw some older people too, including one crusty, old dude with a bald spot and greasy, stringy grey hair wearing skin-tight leather pants and a black leather motorcycle jacket. Maybe the guy was friends with the geezers from The Rolling Stones. I also ran into one of my friends who looks my age and acts younger than I do, but who is actually forty-eight. She grabbed my hands, hopped up and down squealing, "the Pipettes! Aren't you excited to see the Pipettes?!" I'll answer that question in a few paragraphs. The first musical act was a guy named Monster Bobby. Yep, just one guy. He had a keyboard/noisemaker that would play tinny-sounding drum tracks and music box quality melodies with the press of one button. He also had an acoustic guitar that he played along with the synthesizer thing, but slightly out of synch. All of his songs were one minute long. He was awful. Some of us clapped politely between each song, but the audience was glad to see him exit stage right. The second musical act was Nicole Atkins and her band. Nicole is gorgeous and tiny with a voice that belongs to a much larger, sturdier-looking woman. I love her music. Her songs have a full, swelling sound that couple with her echoing voice to be downright haunting. I have a huge girl-crush on her. She wore a lovely midnight-blue dress that was one part sweet and one part rock-n-roll. She has pretty rocker-chick highlights in her long, dark, perfectly layered hair. Her albums will be playing over and over again on my iPod for weeks to come. The third musical act/headliner was The Pipettes. Boo... Watching them was like sitting through an off-Broadway musical with a terrible script about a pre-packaged girl group. How is this band so popular? They're like the Spice Girls 2.2, but with just three girls: Purple-Spice, Fuchsia-Spice and Aqua-Spice: all in matching polka dot skirts. Oh, and guess who was in their backing band? That dork, Monster Bobby, from the first act. Thank goodness Chad was ready to leave after five of The Pipettes' songs, which was four songs too many since they all sounded the same. I missed my gym while I was away from home. I'm addicted to that endorphin rush that 40 minutes on the elliptical machine gives me. I love going and doing my stretches, crunches and girl-style push-ups. I didn't go to the gym for almost two weeks while I was sick with a cold recently. When I returned to the gym, my regular workout was too hard. I had to do an easier version of all my usual stuff. Today I was back at full capacity. Happy brain chemicals abound! I love my gym because it's only for the ladies. No stinky boys allowed. One of the gym employees went through all the weight lifting machines and drew long hair and eyelashes on all of the pictures that highlight which muscle group each machine targets. I find that charming, even if the pictures now look a little like well-muscled drag queens. At my gym, there are two televisions mounted on the wall in view of all the aerobic machines. There's always a soap opera, Oprah, Rachel Ray or Ellen on to watch. No stupid boy shows. There are oscillating fans every four feet at my gym. Most of the ladies who go there are menopause age or older, and those fans probably help with the hot flashes. On a summer day, I make sure I'm in the direct line of airflow of at least two of those fans. Whenever a man has to enter the club, the receptionist gets on the intercom system and lets all the ladies know which area of the club the "gentleman" will be in. All the gym members know that "gentleman" is really codeword for stinky, hairy, potentially-leering man. I also love the convenient location of my gym. It shares a parking lot with my favorite HEB grocery store and a post office. It is a mere four miles from my house. Most of all, I love stepping on the scales at my gym. I've lost twenty-one pounds now. I have thirteen pounds more to lose. I have this picture of myself in my head that is still the same weight I was in college, which is also my goal weight. I get glimpses of that me in the mirrored walls of the gym while I'm exercising. I think, "oh good. I'm almost there." However, I cringe when I see recent photos of myself, because I think I still look F-A-T. It's harder to see the progress in a flattened image with poor lighting. I think my new rule is that only professional photographers armed with light meters are allowed to take my photo. My mom doesn't like to run the heater in her house. There are post-it notes on both thermostats that decree like two tiny yellow tyrants to "leave on this setting". Mom has sensitive sinuses. The heater smells like burnt dust and the dry heater air makes her sinuses itchy. Seriously, she'll sneeze four times in a row at the slightest inhalation of allergen or irritant. My mom's sneezes are scream-sneezes with loud, high-pitched vocalizations. If you're not accustomed to the sound, you might think someone is doing her harm. It's best for all parties to leave the thermostats alone, despite the chilly temperatures here. Wrap another blanket around yourself and have a mug of hot tea. Mimi (my mom's mom) and Papa Roy (Mimi's husband) are here visiting too. Today, SOMEONE turned both thermostats up to 70 degrees while Mom was out running an errand. I bet that heater felt good, but I was at my sister's house when the thermostat-bandit struck, so I was unable to bask in its warmth. I did, however, receive an accusatory phone call from my mom while I was over at my sister's house. She wanted to know (ACHOO!!!) if I turned up the heat in her house. "Bless you, but I didn't touch it," I insisted. I'm at my mom's house, and we're realizing just how many secrets my dad took to the grave with him. 2. My dad didn't label any of the videotapes in this house. Total mystery as to what was on about twenty videotapes. Mom and I went through the tapes today to figure out the contents. There were only four tapes worth keeping, but we at least got them labeled. 3. None of us can figure out how to fix the grandfather clock. We got it set and it's keeping time, but it's still not chiming correctly. At 2:00 this afternoon, it rang twice. Yay! However, at 3:00 this afternoon, it rang five times. Booo... Dad was the clock-whisperer in the family, I guess. 4. We also can't find the remote control for the DVD player in my mom's room. There are approximately fifteen remote controls in this house. None of them work on that DVD player. Consequently, Mom can only watch the first episode on each DVD, because there is no way to go into the DVD menu and scroll around to select options such as the next episode. Maybe I can consult one of those mystics who claims to communicate with spirits and ask them if they can get any answers on these technical difficulties for us. I flew to Raleigh, NC today to see my family. Whoever said that it's all about the journey probably meant something about stopping to enjoy your surroundings along the way; not just at your destination. I must say that I'm a fan of the direct flight. I will pay a little more for the airfare or fly at odd times if it means that I don't have a layover or a connecting flight. I enjoy my time on the airplane reading or flipping through magazines. I do not so much enjoy the time sitting in weird airports waiting for the next leg of my trip, or worse, running through an unfamiliar airport while praying I am able to get to the gate on time for the next leg of my trip. My flight landed a bit early, which is a rarity these days, if recent media reports are to be believed. My mom picked me up at the airport and took me to the closest grocery store to indulge my need for vegetarian-friendly groceries. Then we went to a nice dinner at Cafe Capistrano, which serves healthy California-style Mexican food. My vegetarian burrito was delicious and the cafe had a cute atmosphere with a big fountain in the center of the dining room and lots of brightly-hued artwork on the walls. It's kind of weird that I would leave a Mexican food mecca like Austin, and seek out Mexican food in Raleigh - not known for its good Mexican food - but my mom wanted to try the place too. We both liked it.